Staring back at this interesting Dutchmen, Jackie thinks quick and hurls his jacket at the formidable fighter he now faces. He attacks! Fists! Kicks! A flurry of hands and feet until Jackie is knocked back unexpectedly. The Dutchmen smiles as he skillfully raises the jacket, now wrapped around his foot, all the way over his head without any sense of strain. This is where I pause Jackie Chan’s wonderful action movie Who Am I? and when shock leaves me I let out a quiet, “ WHAT?!? !” The fighter is Ron Smoorenburg and he will be the example for this month’s topic: active flexibility. 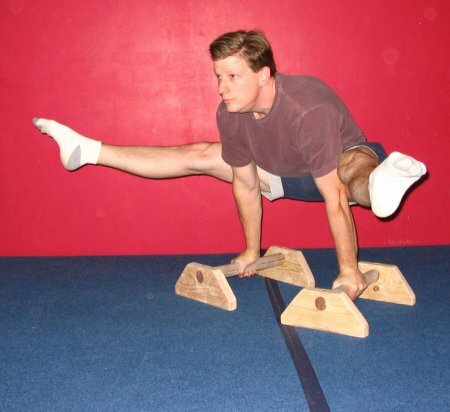 Flexbility in general is a necessary requirement for almost all athletes, traceurs included, and proper development should be a big focus in one’s training regimen. This, however, is common knowledge and if you want to know more about this (which is often refered to as passive flexbility) may I direct you to a book on the subject or to Muse’s wonderfully written article here (http://www.americanparkour.com/smf/index.php?topic=5887.0). Active flexbility is very different than its counter (passive flexibility) and can also be quite complex and challenging to develop and sustain. To use an example, becoming flexible enough to perform a 180 degree sidekick is a challenge in its own, but to also be able to slowly raise your leg to that position and hold it?! Now we’re talking crazy. In active flexibility the stretch of the antagonist muscle is always dependent on the strength of your agonists. The “stretch” (which is really more like an exercise, judging from the many comical faces a person makes when attempting an active stretch) will always be significantly difficult and there are rarely any easy points. Because of this, active flexbility is easy to integrate into a training regimen but hard to maintain due to its mentally taxing characteristics. Although the path is rough, a balance between passive and active is more beneficial than one or the other. Attempting to increase flexbility through solely passive means is a great way to increase your risk of injury in those degrees of movement while only active stretching (to the exclusion of passive) will take obscene amounts of your time to get anywhere. As with most things, the most practical is a happy balance. Similar to other exercises, implementation into your daily or normal workout routine should be slow and careful. Active stretches hover around the line of maximal exertion and it can be easy at first to over-exert yourself. Be sure to have a foam roller or a tennis ball nearby as muscle cramping/spasming is a normal happening amongst beginners. Application is relatively easy and is simple enough to be done daily. Although each trainer will recommend a different range, I find 30 seconds spent near maximal exertion in one particular stretch to be enough for a day. If I were looking to improve the active flexibility of my hip flexors, I may place 30 seconds of a straddle-L at the end of my routine. This is all highly variable of course and you may add or subtract time or frequency as you see fit. If, for example, you want to see better improvements, you may increase the amount of time spent in the active stretch, increase the frequency (once every other day, every day, grease the groove style, etc), or do both. If you are not so worried about active flexbility and the 30 seconds causes excessive soreness, perhaps decreasing the time spent in the stretch is warranted or a drop in frequency. For those that want to mix up their training, even adding as little as 1 pound to your foot can cause drastic changes in difficulty. As a traceur, being able to actively stretch your muscles can help you accomplish many new tricks or skills and can be beneficial in many ways. For instance, being able to pike yourself into a V-Sit may have beneficial translations into a max distance precision jump; allowing you to extend your legs as far as possible (normally inhibted by the flexibility of the hamstrings and strength of the hip flexors). The strength that is developed is very beneficial for the stability of very key joints in our bodies such as the hip and shoulder girdle which receive a hefty load of stress from the kind of work we do. Active flexibility is a useful tool we can use to not only train our bodies and help them become stronger, but also a very effective way at controling our bodies and ensuring joint stability and safety in this physically demanding discipline. To follow is a list of exercises that can be done with their corresponding target area.